Share the post "Gig review: RIVERSIDE – De Casino, Sint Niklaas, 11 November 2018"
The first time I attended a Riverside gig was back in April 2014 and those of you who read my review of the said show will remember that the overall experience involved a very long drive from London to Liverpool, and back – one that took a good eight hours in total! This time, I was truly convinced that I had it all covered; no driving was required on my part – simply making a direct train trip from Antwerp to the central station of a beautiful town called Sint Niklaas and then, literally, a ten-minute walk to the entrance of the quite posh-looking De Casino. What I certainly did not expect, and annoyingly enough no one at the ticket desk bothered informing me of, was that the line to Sint Niklaas was undergoing major engineering works during the weekend, which translated not only to massive delays but the necessary use of numerous different means of transportation. I consider myself very lucky indeed, as I literally made my way into the venue only five minutes prior to the members of Riverside coming on stage to perform what turned out to be an outstanding music show. The Belgian crowd, clearly excited and in great anticipation, showed its enthusiasm quite early on – the very moment the hauntingly beautiful pre-recorded Wasteland intro made its presence and the lights of De Casino were appropriately dimmed. Guitar-driven and reeling with energy, both “Acid Rain” and “Vale Of Tears” were ideal tracks to open tonight’s set, however, the band first proved its progressive pedigree during “Reality Dream I” – a six-minute piece full of syncopated guitar parts & beautiful bass lines courtesy of the band’s sensational frontman Mariusz Duda. The mood changed drastically during “Lament” – a moody, emotionally-charged ballad from the band’s latest magnum opus “Wasteland” but energy and passion were injected back into the show during “Out Of Myself”. The band’s decision to perform half of “Second Life Syndrome” did not meet with disagreement by the crowd, with people clapping their hands rhythmically during its impressive rendition, while the use of Theremin in strategic times during “Left Out” added a beautiful dimension to this Floyd-inspired composition. Seeing Duda reach for his acoustic guitar made us all think that something truly special was in the works. “Guardian Angel”, a song written with the band’s ‘fallen comrade’ Piotr Grudziński in mind (the guitarist passed away back in 2016), was introduced by Duda as a ‘song for survival’ and was so emotional in nature that quite a lot of us in the crowd just about held our tears in check. Pretty content to see that my favourite track from “Love, Fear and the Time Machine” was being performed tonight, I allowed myself to be mesmerized by the Floyd-inspired harmonies of “Lost (Why Should I Be Frightened By A Hat? )” while I was unequivocally blown away by Piotr Kozieradski’s dynamic drumming during “The Struggle For Survival”. 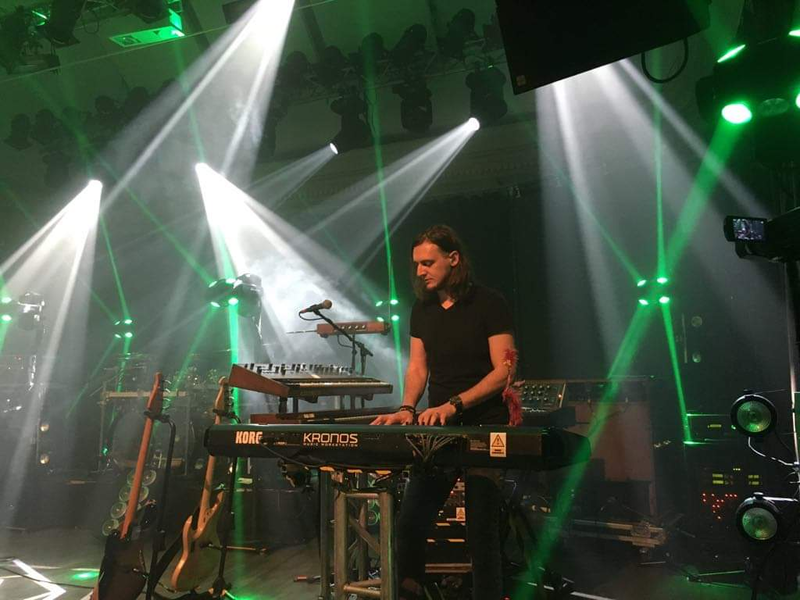 Though never properly introduced to us, guitarist Maciej Meller did a fantastic job performing Grudziński’s demanding parts to perfection and that really showed during the dramatic Marillion-sounding piece “Forgotten Land” and the follow-up “Loose Heart”. The band’s main set was concluded with the folk acoustic guitar tunes of the eight minute “Wasteland”, however the four Poles returned on stage to offer an impressive encore based on the triumvirate of “The Night Before”/“O2 Panic Room”/ “River Down Below” – the latter adding more emotional value to an already charged performance. When the members of Riverside first announced their decision to not replace Piotr Grudziński but to continue their trade as a trio back in September 2016, many of us wondered how this decision would influence the band’s ability to compose and perform its demanding material on stage. Two years, one amazing studio album and one sensational live performance later, Duda & Co proved to me without a shadow of a doubt that there is a bright future ahead of them. I, for one, will be there to support the band every step of the way and I am absolutely convinced that quite a few of you will be there for Riverside as well. 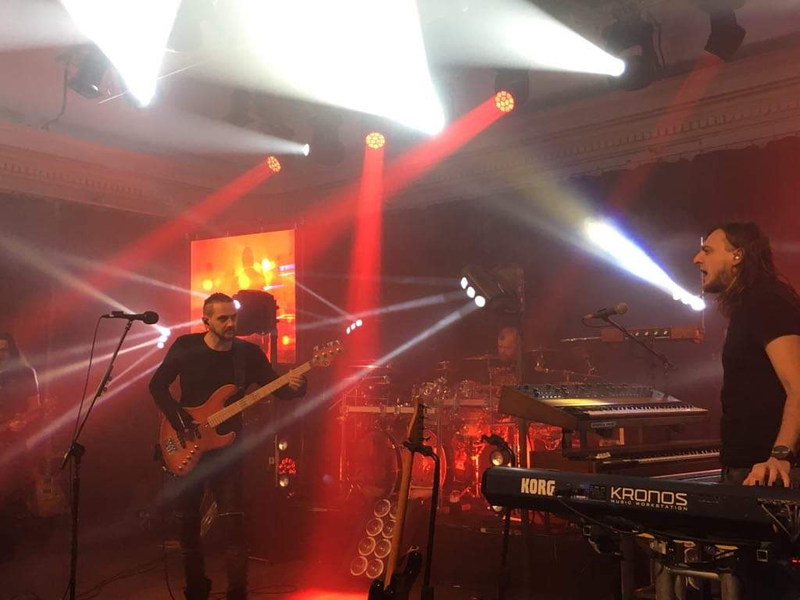 This entry was posted in GIG REVIEWS, PURE METAL (All posts), Pure Metal/Gig reviews and tagged 11 November 2018, Belgium, De Casino, gig, Mariusz Duda, prog, Progressive Rock, review, RIVERSIDE, Sint Niklaas. Bookmark the permalink.